Worcestershire's young players will have learnt a lot from the side's chastening One-Day Cup campaign, says director of cricket Steve Rhodes. Despite only winning one of their eight group games, Rhodes says Joe Clarke, Ed Barnard and Alex Hepburn, all 19, have coped well with the experience. "We've played some young lads and there's been some nice performances," Rhodes told BBC Hereford and Worcester. "It's not been the best tournament, but they'll all be better for it." Joe Clarke is averaging 32.27 with the bat from 11 first-class innings, with four half-centuries. He also hit 131 not out in the One-Day Cup game against Gloucestershire. 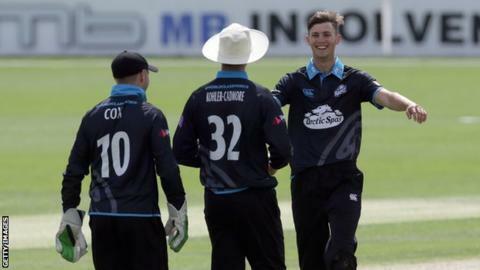 Ed Barnard was Worcestershire's leading wicket-taker in the One-Day Cup with 12, as well as hitting 51 against Somerset. Alex Hepburn marked his debut with 4-34 against Leicestershire and followed that up with 2-44 and 32 with the bat against Derbyshire. Wicketkeeper/batsman Clarke and seamer Barnard have been rewarded with new long-term contracts for their displays in one-day and Championship cricket in their first season in the side. Fast bowler Hepburn played the last two games of the One-Day Cup competition, taking 4-34 on his debut in the win over Leicestershire. "He's played really well in our second team and his career is moving forward - we're very pleased with what he's produced," Rhodes said. "If he can have a strong winter in Perth, he'll be challenging for places next season."